Why are both Schrader and Presta valves still used on tubes? It is standard for road bikes to adopt Presta, whereas nearly all else use Schrader. The main thing is that the Presta valve is thinner, and takes less of a bite out of the rim. This is quite important as the rims get narrower. Further, the Presta works better with hand pumps in that there's no spring that the pump needs to overcome to get air into the tire. 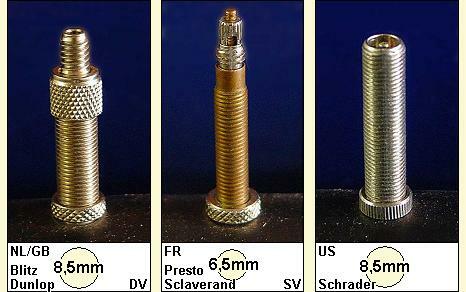 Also, the Presta always has the fully-threaded body (which is possible with Schrader, but rare), so a nut can be used to hold the valve in place -- again, quite important with hand pumps. Never had a bike valve stem break on me, that I can recall. This primarily comes up as the pressures in the tires get higher. With lower pressure wider tires, Schrader makes the most sense, if only because you can hit a gas station for some air pressure. Presta makes more sense on higher pressure tires, since it allows you to pump in higher levels with a floor pump. Per the comments let me try and clarify. When you use a Schrader stem the valve is depressed by a thingy in the pump head the whole time. With a mechanical constant pressure pump (like at a gas station) this is fine. But with a floor pump where there is a pause between pumps, Presta works better because each time you release pressure, the valve head closes. Then as you build pressure in the pump, when it exceeds the tires current pressure it forces the value to open, allows air in, and repeat. Thus you can pump to higher pressures with it. (Or at least with poorer quality pumps. But if it bothers you, get the little one dollar adapters, and you can use a car pump with no issue. Schrader valves are more robust, this is the reason why you see them universally in use for vehicle tires. With Presta, you have to be more careful when putting in or taking off the pump nozzle or you might bend or even break either the rotating (locking) tip of the valve. You could also go to literally any gas station to pump air to your tires if you are using a Shrader valve. Presta's advantage is that it is thinner and the rim has a smaller valve hole in which case it makes the rim stronger. This can be a factor especially in thin bicycle rims. Another advantage of Presta valves is they can be made longer, a lot longer in fact than Shrader valves. This is especially important when you have deep aero type rims. I've also had fewer issues with crap clogging the valve with presta valves; as long as you remember to spin the valve closed you don't need a valve stem cap. This is particularly important if you're riding in mud or dirt. I run presta on both my road and mountain bikes for this reason. Your rim will be drilled for one of the two. Usually a schrader. 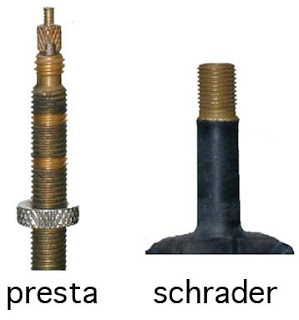 A presta (which is thinner) will allows fit in a schrader sized whole, but give more freedom for the valve to move around, often causing a valve wall tear and leading lots of people to think "wow what a useless valve". A typical case of human error. This can easily be countered with a schrader to presta valve converter, a cheap little bit of plastic cushioning which usually costs pennies. Prestas are far more performant in terms of the amount of pressure they can hold, and the rate they can take air in. Schraders are widely used not just because "they're the best" but because they've become a standard which is hard to break away from. In addition to what others have said, many gas station air compressors won't push the tire pressure past 80 psi. This is fine for cars where the tires are usually inflated to about half that, but no good for a road bike where you probably want 100+ psi. This means that you're stuck using a floor pump, a frame pump, or a Co2 pump alll the time. And as others have mentioned, Prestas just work better with hand pumps. And if you're filling your tires to 100+ psi all the time, you might as well have a valve that works easily with the pump that you'll be using. I have used both presta and shrader valves, like neither. I go for Blitz/Dunlop. Easier to use than both others. Maybe it is just a case of what you are used to, but I think the Dunlop least fussy, easiest to use and least likely to fail. When I was racing sixty odd years ago you either had a valve with a Valve Rubber, or high pressure valves, the thinner high pressure tires and tubes, and Tubs [so called tubeless tires] had these as you call them Presta valves we called them high pressure and I would think they are a refined Schrader valve. Which kind of tube valve is the best?